I made a bit of a faux pas earlier in the week and completely forgot that it was my turn to do the charity baking at work for Friday. 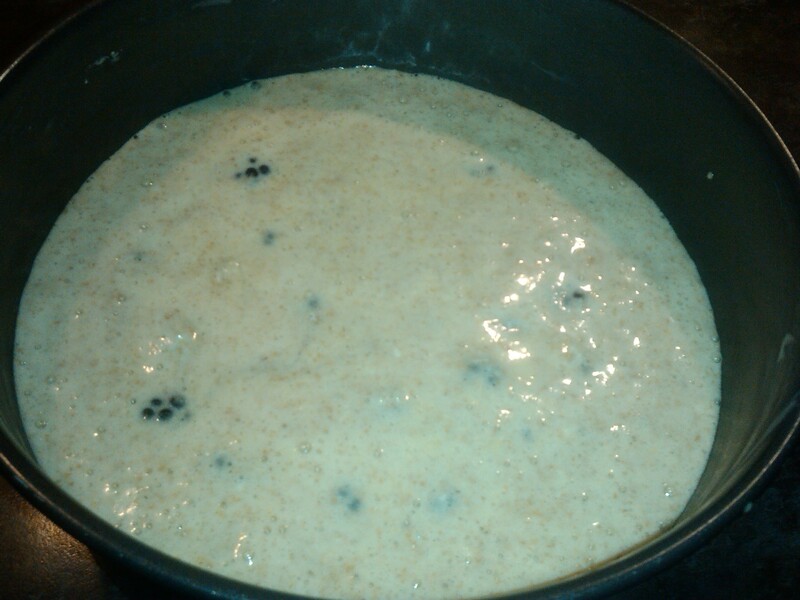 Luckily, I’d already planned to do some baking this weekend, so I could promise to bring something in for Monday. I decided on a carrot, apple and raisin cake that I’ve made before and this rather lovely blackberry and coconut olive oil cake. Granted, it’s not really blackberry season, but the supermarket had some going cheap and I couldn’t resist. I trawled through quite a few blackberry baking recipes before I found this one; there were a lot of blackberry and apple cake recipes but as there’s apple in the other cake I made, I wanted to do something a bit different. If you know me you’ll know exactly why this particular recipe caught my eye – the addition of coconut! The cake was really easy to make, bar nearly 10 minutes of whisking the eggs and sugar together (I did this with an electric hand mixer on the lowest setting, but how I wished I had a KitchenAid!). 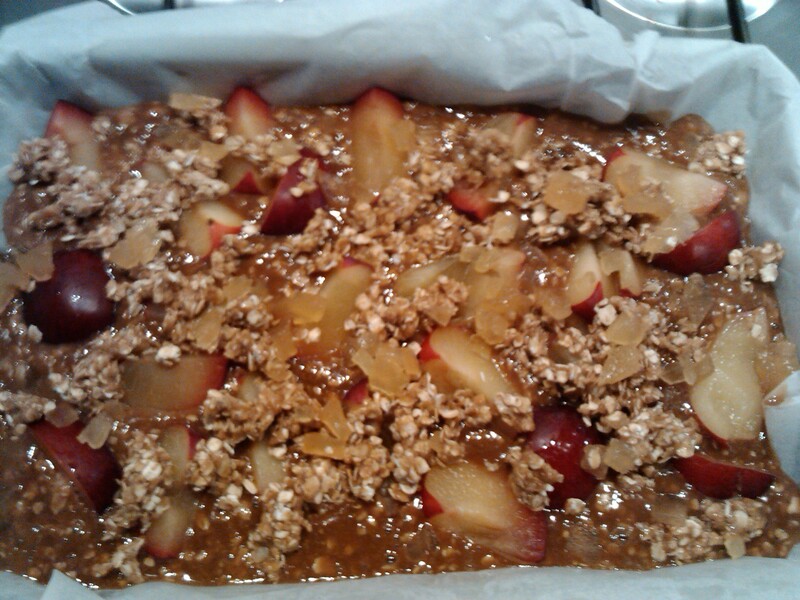 Everything else is folded in, poured into the tin and baked. And that’s it. It’s definitely recommended to take the time required to increase the volume of the eggs and sugar, because there’s no baking powder in this recipe – and the flour isn’t the self-raising variety! All of the lift comes from the air incorporated into the mix during the whisking, so do make sure you stay the course if you attempt this recipe. I have to say, the cake tastes absolutely fantastic. 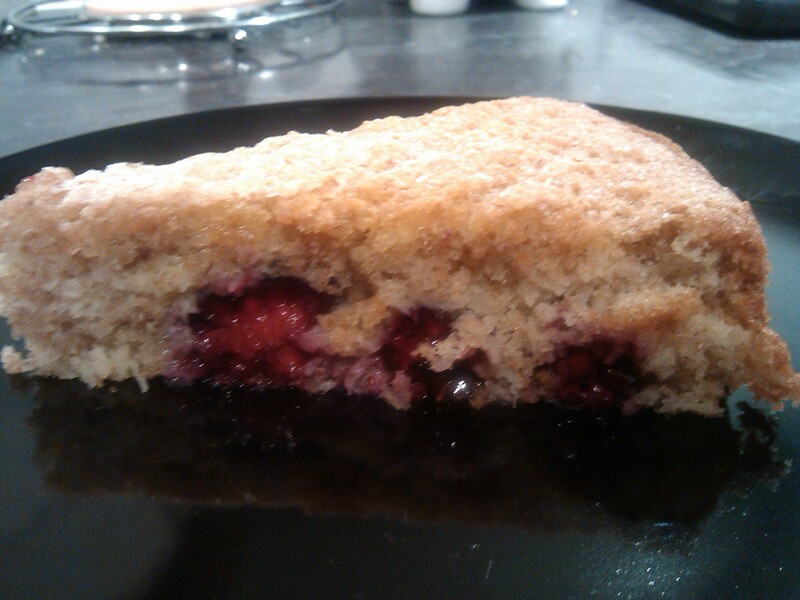 The blackberries and coconut go wonderfully together, and the wholemeal flour doesn’t make the cake at all dense. It might be the variety of olive oil I used (bog standard supermarket brand), but the olive oil isn’t that discernible to the palate, so there’s no danger of an odd flavour intruding into the beautiful relationship between the coconut and blackberries. 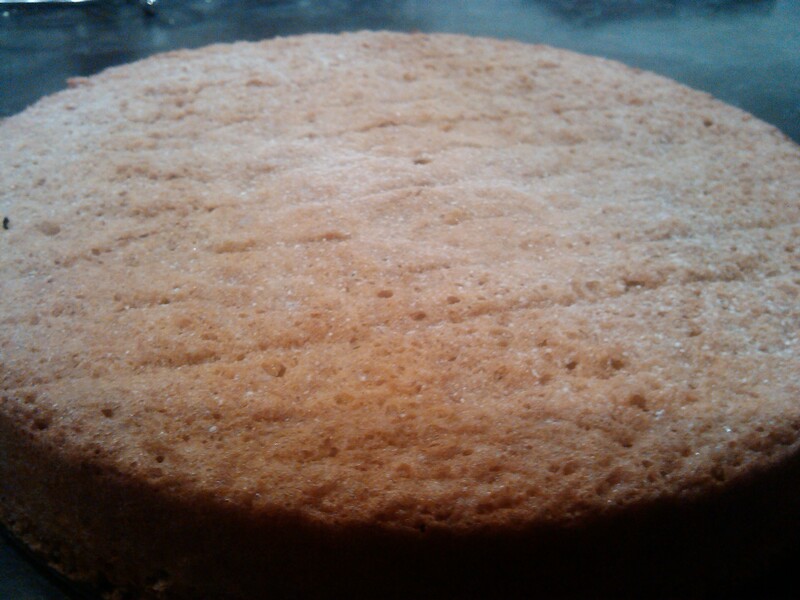 It’s worth noting how (relatively) healthy this cake is – no butter is used apart from for greasing the tin. If you cut the cake into 12 pieces, each portion is only 153 calories! It’s definitely a good recipe for everyone on the diet wagon this month, but it’s lovely even if you aren’t – it certainly doesn’t taste like a low fat cake. I can even imagine having this warm with cream as a dessert. I just hope my colleagues are pleased enough with both cakes to forget about my moment of forgetfulness! Happy 2014! I’ve made a resolution to bake more and therefore blog more this year – I feel like I didn’t do quite enough of either in 2013, especially towards the end of the year. 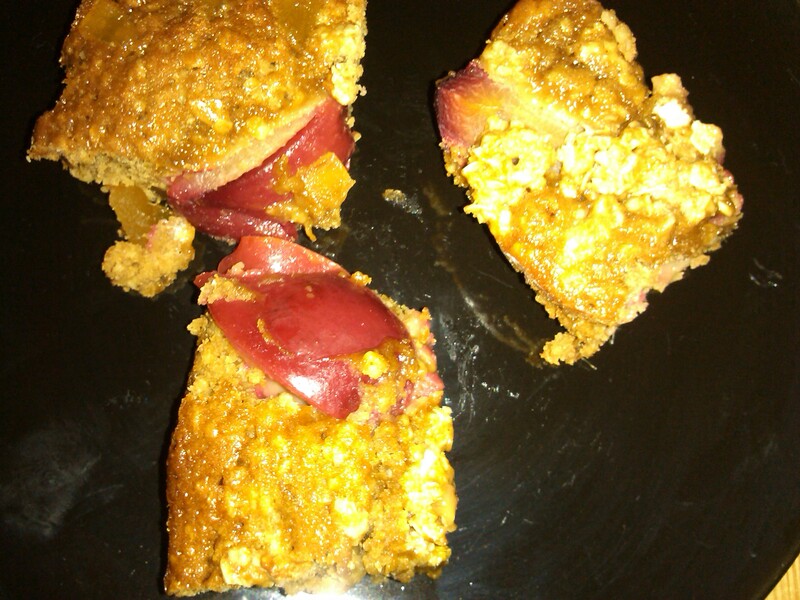 To kick things off, I made this seasonal and comforting oaty gingerbread plum slice yesterday. 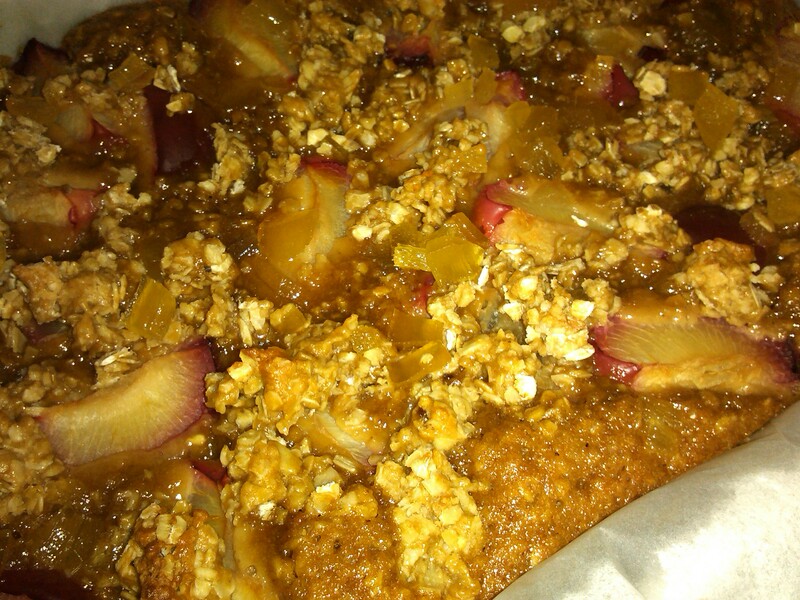 The slice is basically a layer of gingerbread topped with plums and a crumble topping. 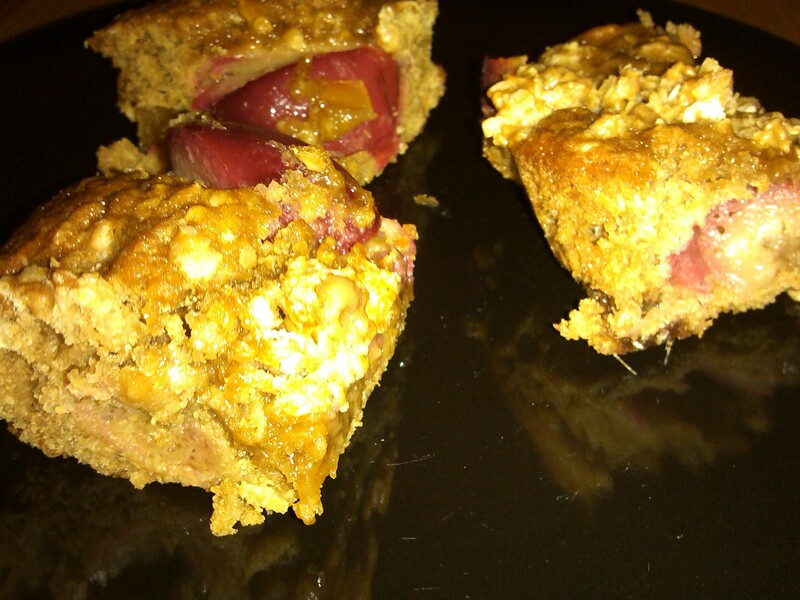 There are oats in both the gingerbread and topping, and the ginger flavour comes from ground and stem ginger. 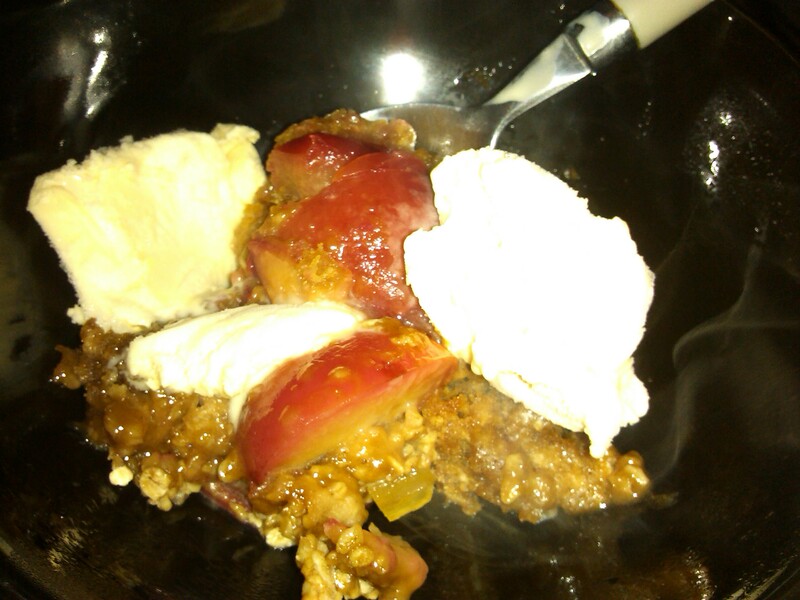 It was pretty easy to put together, although my plums weren’t quite ripe so it was a slight struggle getting the stones out. The gingerbread is made entirely in a pan, which makes for less washing up! All in all, this was a rather nice bake to begin the year with – spicy, satisfying and slightly virtuous thanks to the oats and fresh fruit. I would bake it for longer next time, but that’s about it in terms of changes!